''The Devils Greatest Trick was making you think he never existed''. This is one of many recurring themes in the superbly crafted paranormal thriller The CAT,The Devil,and Lee Fontana, by the husband and wife author team, Shirley Rousseau and Pat J. J. Murphy. The tale features colorful complex multi-dimensional characterizations of the central players: Lee Fontana a train robber paroled from jail after many years of incarceration, the Devil determined to avenge a bet he lost, and a ghost cat, a friendly and comforting spirit to steady and embolden Lee to fight and defeat Satan. The book is filled with other fascinating participants including a little girl who has amazingly accurate premonitions, a psychotic stalker and the lover that got away. In a fascinating narrative, the authors manage to intertwine the lives and destinies of all the participants. 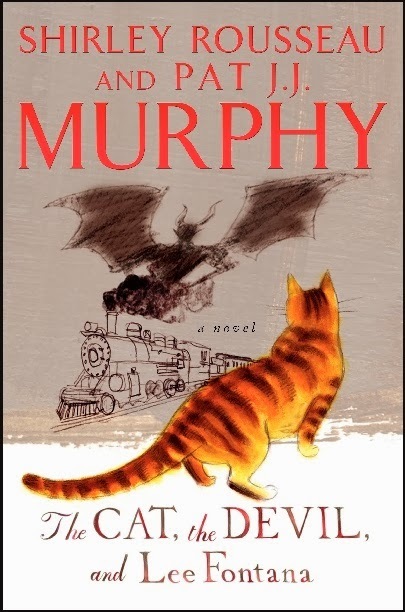 It has been often noted that the devil is in the details.The Murphys have spun a yarn that takes the reader on a magical journey filled with mystery, intrigue and the supernatural. Utilizing literary techniques such as flashback and foreshadowing we learn how many years ago Lee's grandfather bested the devil on a wager. Lucifer is determined to get his due however, vowing to harass his descendant Lee until he owns his soul.The devil is an expert observer of human nature which makes him such a formidable adversary. He realizes most people''teeter on a cusp between evil and a blind life of virtue''.The devil believes if a person has a respectable amount of evil within them he will be able to take control of them.The antithesis of the devil is the yellow ghost tomcat Misto. He is the embodiment of Lee's conscience ,all that is right and good. He is a powerful ally at the times Lee starts to succumb to temptation. Lee is a lifelong criminal, finally paroled after many years, who has good intentions, but is very conflicted. I will not ruin the story for you by revealing the ending. Suffice it to say you will not be disappointed. Kudos and accolades to the authors for creating such a suspenseful page turner. I venture to say you may have to wait for Hell to freeze over until you encounter a better read. Shirley Rousseau Murphy is a noted children’s book author who has received five Council of Authors and Journalists Awards. Two of her children’s books were written in collaboration with her husband, Pat. Pat J.J. Murphy spent his spent his career as a US Federal Probation officer in California and in Oregon, the Chief USPO in Panama, and also in GA where he retired as Chief Probation Officer for the Northern District of Georgia, after which the Murphy’s returned to their home in California, settling with their two lady cats on the Central California coast. IN FULL DISCLOSURE: I am Lenny Gittleman, the husband of Caren Gittleman the creative force behind the popular blogs Cat Chat with Caren and Cody and Dakotas Den. She asked me to write this review because of her heavy workload .All opinions expressed are my own. I am a 36 year retired Language arts/Creative writing teacher Special Education Instructor and Debate Coach (with the Detroit Public Schools), with a Master's Degree in Special Education. I have had a lifelong love of literature and believe reading is a shortcut to the acquisition of knowledge. Neither Caren nor myself were compensated for this review. She was sent a copy of the book in exchange for an honest review. ENTER TO WIN!!!! The Publishers have kindly offered THREE COPIES (one copy of the book will be given to each winner), of The Cat, The Devil, and Lee Fontana to give away to our readers who are 18 and over and who reside in the U.S. AND/OR CANADA. (Hardcover a $19.99 value). ENTER ON THE RAFFLECOPTER BELOW!!! WINNERS WILL BE ANNOUNCED ON TUESDAY, FEBRUARY 4TH! GOOD LUCK!!! Ok I was having a "fake blonde moment" just saw you DID enter! Didn't want you to go ahead and spend money on a book that you might win! Good luck! Thanks for entering! Super review Lenny....this sounds like a really great story idea and a fun read......we entered the giveaway! So nice of you to help Caren out - I know she's almost always up to her eyebrows and beyond with work......Hugs to both of you! We agree it sounds like a fun read. Don't include us as we are across the pond. Have a marvellous Monday Caren and Cody. Sounds like a good book! I think you did a fantastic review, and so very nice of you to help your beautiful wifey out with her work load hehe! Well done! That was a terrific review Lenny and the book really sounds quite interesting! Thanks Brian! I will be sure that he sees your comment, he did a MUCH better job than I do! I want to win, and thanks so much for the opportunity to do so! I love Shirley Rousseau Murphy :) Great review! thanks so much Melissa!!!! He really was a life-saver, I KNOW you understand!!!!! Good luck! Oh! Is that available on kindle? Sounds interesting! Thanks for the review. And also thank you for the sidebar badge! I really appreciate it! :) - Crepes. It probably is....I didn't check...ooops!!!! You are welcome! Be sure to enter if you want a chance to win! You are welcome about the badge too! I would love to win. Sounds like a really good book. Thanks for the giveaway. I love books! I hope I get a copy. I love a good page turner--and this one sounds like one! Sounds like something I'd LOVE!!! Hi Caren. Loved Lenny's review. BTW, I ILLUSTRATED that cover, and hand-lettered the type below the cat's feet. I entered, because I never got a copy of the book! That was a great review and sounds like just the sort of book I enjoy. I looked it up on Amazon and see it will be available in the UK from Feb. 11th. Crepes asked if it is available on Kindle, yes it is. Thanks so much Flynn! Will make sure Lenny sees it! Thanks for checking out the info, I was so busy I forgot!! Thank you! Good review, Lenny. And Ann, the lettering and the cover are very cool. I can't believe you didn't get copies. I'd like to win this book, thanks! I would love to win a copy, this sounds like a fun read. Very nice of you to help out Caren with the review. Kudos to Lenny for an awesome review. We'd love to win. And thank-you for making that amazing poster for our friend Alana's Cat Dance film! Layla thanks so much! He did do a wonderful job! Good luck! Oh I didn't make the poster, I just posted it but thanks! Lenny (may mes calls yous Lenny)Yous did a marvelous job! If mes don't wins one of the books,me is going to makes Mommy buys is - wait - she says it sounds like a great book, she might buy it any way! I think it's so PAWSOME that Mr Cat Chat did this review! Last year at BlogPaws they wrote on my husbands name badge "my wife's new blog" LOL! The illustration on the cover of the book is beautiful. Great review! @Amelia OMG i am laughing at "Mr Cat Chat!" I love it! I just read this to him. LOVE what they wrote on your husband's badge...guess what? "Mr.Cat Chat" is coming this year so you will meet him too!! Hoping your husband is coming! Oh and about the Kitten Bowl....I'm with you!!!! Mr. Cat Chat! That is AWESOME. Lenny did a great job with the review. I would hire him if I were you! :) What a great helper. Oh, and I want to win the book!